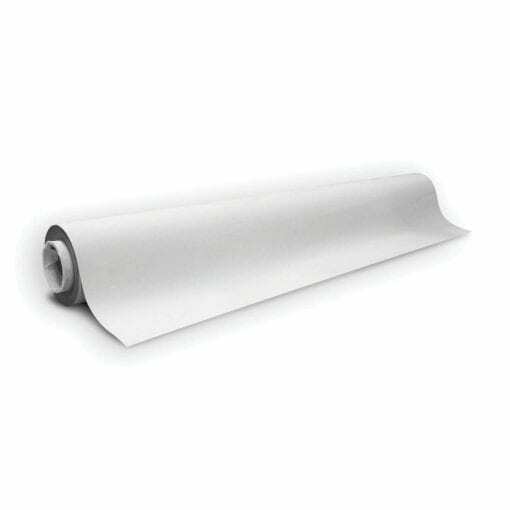 Our Wide Format Printable White Receptive Sheeting with WO/WO and Self Adhesive has a width of 1200mm and a thickness of 0.32mm, one side is white with a write on wipe off laminate and the other is plain magnet receptive. This product is our 1-14 Metre Rate. If you are looking at ordering more than 14 Metres of this product click here to check out our per roll rate. This sheeting (With its very long description) is a lot packed into one. It is a receptive sheet made of iron particles contained in a polymer matrix and is therefore not magnetic instead, magnets will be attracted to the sheet itself. On one side there is a white printable surface that is coated with a write on wipe off laminate and the other side a self adhesive backing that is protected by a thin paper sheet. Just peel the sheet away when you are ready to apply the receptive.